MILAN, April 9, 2019 /PRNewswire/ -- The Jakarta Tourism and Culture Office (JTCO) and the Indonesian Contemporary Art & Design (ICAD) are unveiling the debut of 11 Indonesian artists at the Milan Design Week 2019 in Superstudio Piu, Zona Tortona, Milan, starting now until April 14, 2019. Entitled 'Essential Jakarta,' the expo pushed Jakarta's indigenous Betawi culture to the next level, with technologies and contemporary art curated by Indonesia's leading design firm, Artura. "We've led a can-do attitude for Indonesian artists, reviving Betawi tradition to meet the changing demand of global visitors. 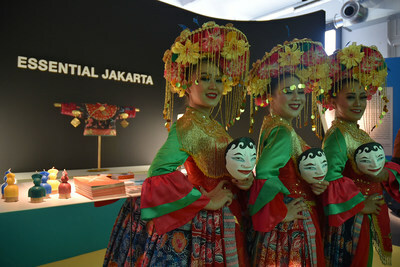 With immersive blend of culture and technology, we also delved into the cultural narratives behind interactive journeys, that brings a novel form of Betawi's culture to shine on international stage," said Dr. Edy Junaedi, Executive Director of Jakarta Tourism and Culture Office (JTCO). The contemporary artworks are featured in a four-petal designed booth to manifest the form of Jakarta's iconic snack, Kembang Goyang. To enhance visitor's experience, Betawi's traditional dance with interactive video mapping were showcased to give a new twist to cultural and contemporary works. Authentic Betawi cuisines are also served during the expo, including Gado-Gado and Soto Betawi. Remarking the 70 years bilateral relations between Indonesia and Italy, the expo also invites business professionals from around the globe to hold one-on-one meetings, reclaiming Indonesia's pavilion as the best platform to exchange with European businesses at the world's most-anticipated exhibition.